Sarah Larker returns to a cave where her sister disappeared ten years earlier. 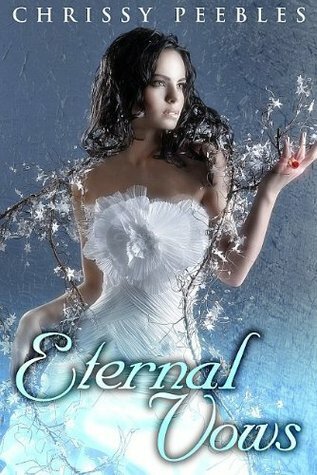 She walks through a portal and is mistaken for a runaway princess on the run by a dangerous immortal king in medieval times. Her plan is bold as well as daring-become this princess, wed the king, and slip on an ancient wedding ring that will unlock the portal back home. Then find her sister and run as fast as she can out of Dodge. But taking on the identity of Princess Gloria comes along with dangerous consequences; and slipping on the ruby ring comes with an even higher price. Ooooh freebies you are such a hit-or-miss I swear. This one sounded super good and I adore the cover. That dress! So pretty! However, the rest was.......barely tolerable, I guess you could say? The only thing that kept me interested was the world and the search for Sarah's sister. The rest made me sigh and roll my eyes. The world was indeed interesting and I want to learn more especially about the Immortals and the other creatures roaming around. There are some things that confused me and I hope it is explained better later on. But I don't think I'll read on, so I guess those answers will always be lost to me. Sighs. Poor Sarah's sister. :( She went missing many years ago under suspicious situations possibly due to a Bigfoot. This caused Sarah to become a Bigfoot researcher to prove she wasn't crazy and maybe find a clue to find her sister. This was an excellent and the most interesting aspect of the story. Now that I know the truth I can lay this story to rest. It took forever, but I'm glad I hung on. Now...the rest of the story? Meh. Sarah was okay and Frank wasn't bad either. Victor was annoying. Sarah's team was unneeded and annoying. There was some humor going on and it did make me chuckle at first, but after so much of the same and never-ending stupid jokes. They were recycled and so cliche. Bleh. Along with the never-ending jokes, there were never-ending plot holes and confusing explanations. A lot of the story didn't make sense. Like my issue was the knowledge or lack off of the dimensional world and portal. One would think that the Immortals who are hundreds of years old would have some sort of knowledge that there are other worlds and dimensions especially since their magic rings are the key. I say this because there are a whole bunch of peasants who know this.....so.....why wouldn't the most powerful and magical beings? Silly. Super silly. That was just one example. In the end, this wasn't terrible, but it wasn't amazing. There were a couple of things I liked and that kept me from throwing in the towel, but overall....meh. I'll give this 2 stars.